Photo: Our director’s sons are happy for the great coconut harvest this month. 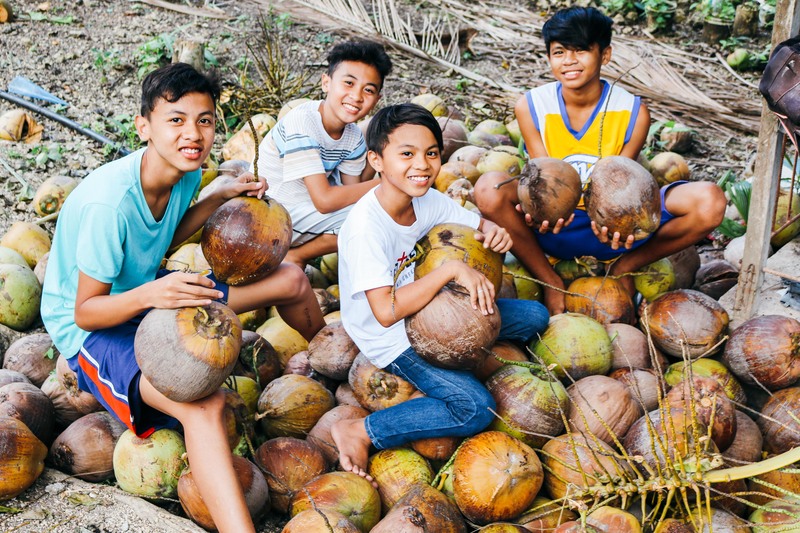 Today we want to share the good news that our coconut harvest this month was abundant — we gathered 580 mature coconuts and sold them at market for $54, which helps to supplement our Cebu programs since we harvest our coconuts quarterly. We are looking forward to another bountiful coconut harvest in November. Our coconut grove contains 85 mature coconut trees, but we have 115 coconut trees total, including 30 new coconut trees which we planted in 2016 — the new coconut trees will mature in 6 years. In addition to selling the mature coconuts at market, the younger coconuts are used to add a delicious, refreshing item to the children’s diets. Our banana grove continues to thrive with 103 trees which are harvested weekly — we harvest about 6-9 large bunches of bananas per week, which gives us an average weekly profit of $38. Our profits from banana sales quickly add up since we harvest bananas every week. Also, this nutritional staple in our children’s diets provides them with a great source of potassium along with other nutrients vital to their good health. In May we repaired the small secondary pond structure at our fishery — it previously had suffered many cracks and we were not able to contain water or fish in the structure. We are happy to report that our native team secured the repaired pond structure with a waterproofing agent and filled the pond with water — it is now in the perfect condition to add 3,000 fingerlings at the end of this month. In addition, we have approximately 1,700 mature fish in the large pond structure at our fishery. In May our fish harvest gave us a profit of $81, so we are thankful for this continual source of income to also help supplement our programs. Our hen house project continues to operate smoothly, an essential part of our farmland enterprise. We currently have 197 hens and egg production is at peak levels — our hens are currently laying an average of 130-160 eggs per day. The demand for fresh eggs from our neighbors is so great that our native team sells them on a wait-listed basis directly to the consumers daily, which is currently bringing us an average profit of $80 per week. One of the 10 goats living at our goat farm recently gave birth to 2 baby goats which will bring us good fortune in the future as we expect to profit around $56 per goat in market sales. We currently have 2 pigs living in our piggery which we plan to sell at market in August with an expected profit of $282, and we plan to soon purchase 6-12 new pigs to sell in the future. Along with your support, our farmland projects help with some of our funding needs, providing the means to help impoverished children and orphans to excel in their studies at school. 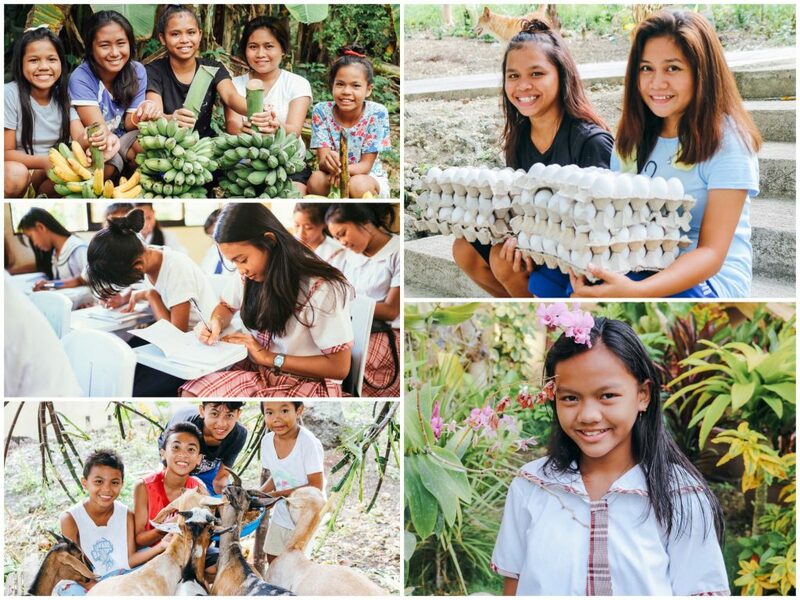 The children enrolled in our Children’s Hope Center on the island of Cebu are currently studying English, science, math, social studies, their native Filipino language, music, art, physical education, health, religion, and woodworking and other trade skills in school. Our Hope Center after-school care program is helping to keep girls and children successfully enrolled in school, which is especially important for the girls who were severely at-risk before our program intervened in their lives. It was reported in 2009 that Cebu is a destination, source, and transit area for human trafficking where victims are brought to be “processed” before being sold in the Philippines and other countries into lives full of danger, suffering, and despair. We want to share the redemptive story of one of the girls benefiting from the nutrition and education support at our Children’s Hope Center, preventing the possibility of such a tragic life: 13-year-old Darna. * She is very happy that she was able to join the after-school care program because it is an immense help to her and her family, and it has made a big impact in her life. Darna’s father is a jeepney driver and her mother is a housewife, and they are dedicated to their jobs and are Godly people. Darna’s father approached our field director and asked for help with her needs for school. Our field director told Darna’s father about our after-school care program and he was very interested. The program encourages Darna and her family because they do not have to worry about what Darna is lacking for school because we provide them with what they need. Now Darna can study without being anxious, so it is a big help to all of them. Darna is now in the 11th grade. Her favorite subjects in school are English and math. Darna’s ambition in life is to be a teacher so that she can share her knowledge with others. Earlier this month, 16 of our hens were stolen by some dangerous locals who are jealous of our native team and their success, and they also do not agree with our Christian beliefs. They have tried to intimidate our team through vandalism, and by previously poisoning our guard dogs. We have since placed a padlock on the gate to our hen house and leave a light on at night, but we are in desperate need of CCTV security cameras that were damaged by lightning during a severe thunderstorm. Thus, we are seeking to raise $1,235 to purchase 10 CCTV security cameras for the safety of our children, our native team, and our farmland enterprises.